Sunrooms are a popular addition to a home that can offer a versatile place to entertain guests, lounge, or simply enjoy the outdoors without being bothered by pesky insects and glaring heat. If you are wondering what a sunroom is, then you may have heard them referred to as solariums, garden rooms, sun porches, or patio rooms. In one state, sunrooms are so common that they are simply called Florida rooms. If you are considering this fun way to update your home, then here is what you need to know about the types of sun rooms that are available and how they can transform your living space. For most homeowners, the main advantage of a sunroom is to be able to enjoy the outdoors without the hassle of contending with the weather elements. Because they are screened in, you can also keep insects out while still allowing the fresh air into the room. Adding a sun room also creates an extra room in your home that can be used to suit a variety of purposes. Whether you want to enjoy a private soak in your Jacuzzi or you want to provide a separate space for the kids to play, a sunroom can be the perfect solution to upgrading your lifestyle. Sunrooms are generally custom-designed to suit the home to which they are attached. Usually, a sunroom will be placed on the side or back of the house, and most backyard patios can be used as a base for the room. For most sunrooms, a brick or wood base will be used to support the large glass or plastic panels that allow the sunlight to beam into the room. Screens and sliding glass doors may also be installed for those who prefer to be able to open up the room and allow the fresh air to filter inside. In the past, sunrooms were often used as sitting rooms where people entertained guests or enjoyed reading a book in the comfort of a sunlit area. 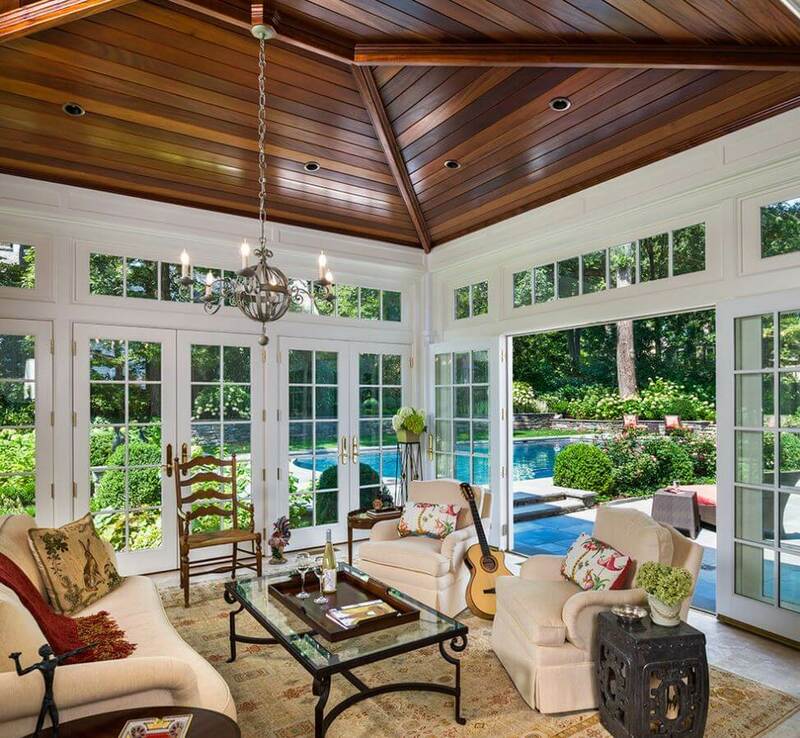 However, modern sunroom designs are incorporating themes that can turn the room into an activity-based area that reflects the homeowner’s interests. For example, you can transform your sunroom into a private oasis with a spa, heated flooring, and tropical plants. Alternatively, you could turn it into a theater room where you can watch movies with your family and friends while enjoying the sparkle of the twilight outdoors. Sunroom décor is best selected according to the functions for which you have designed your sunroom. Decorative fans are often placed to help cool the room down while adding a touch of style. Plants, outdoor-style seating, and tables also add comfort without detracting from the outdoor atmosphere. When decorating a sunroom, it is important to keep in mind the resiliency of the décor to fluctuations in temperature and sunlight. Choose artwork, window treatments, and other decorations that can enhance the room while resisting fading and wrinkling due to humidity. However, climate-controlled sunrooms can be furnished with any type of décor. Whether a home is still in the planning stages or it is already built, sunrooms can offer a versatile way to add value while creating a beautiful space that can serve a variety of functions. Now that you know what a sunroom is, you can begin shining the light on your favorite interests while creating a unique space that is tranquil and inspiring.